We now have major crops that have fallen under the shadow of genetic modification. Some of these crops have insecticides built right into them and are registered as insecticides, such as Bt corn and soy plants. These plants have not been tested for safety. Other GMO plants, such as sugar beets, are designed to tolerate being sprayed with glyphosphate (commercially known as Roundup). Insecticides and pesticides work by disrupting the metabolic processes of insects and plants. And they do the same thing to humans. In addition, these insecticides and pesticides often contain heavy metals, such as arsenic and mercury. 40% of high fructose corn syrup products made from GMO corn in a random test had excessively high levels of mercury. Infants born in the U.S. test as having over 200 different man-made chemicals in their body. The insecticide that is produced by Bt corn is one of these. Epigenetics, the switching on and off of genes, can be triggered by the GMO foods and the pesticides and herbicides they are grown with. In studies of identicial twins, the twin with autism or more severe autism has more genes silenced than the less autistic or neurotypical identical twin. The United States government doees not require that GMO foods be tested for safety. 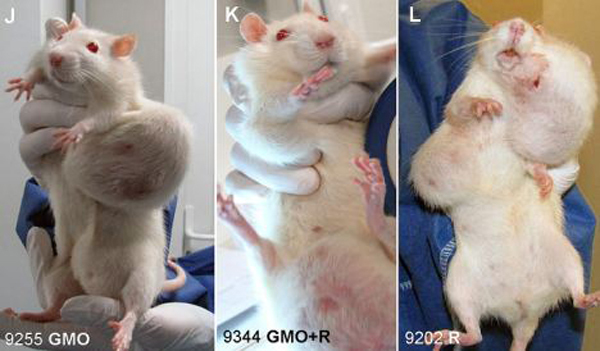 Yet independent study after study indicates that test animals fed GMO foods have higher levels of birth defects, brain damage, liver damage, cancer and even become unable to reproduce after several generations of being fed GMO products. Some of these crops and their pesticides mimic hormones, disrupting normal development in people during pregnancy and childhood. The United States government's response to this was to enact legislation banning using GMO crops unless the companies who make the genetically modified crops give approval. Creating a monopoly on the seeds used to grow crops is highly lucrative, bringing in billions of dollars for Monsanto and Dow, since they began to be pushed into our food supply, starting around the year, 2000. They not only sell the seed but the pesticides required to grow them. The amount of toxic Round-up which has been shown to cause genetic mutations in animals in watersheds exposed to it, and to silence genes in animals exposed to it in parts per billion, has increased several thousand times in use since these crops were introduced. Roundup herbicide has been shown to cause birth defects in amphibians, embryonic deaths and endocrine disruptions, and organ damage in animals even at very low doses. Research indicates Round-up does not readily break down in the enviroment, and even evaporates into the air and then rains down upon us. A new study shows that Round-up is likely to cause gluten-sensitivity, likely contributing to the epidemic of people who are now allergic or intolerant of gluten containing grains, including wheat, rye, and barley. The percentage of Americans with three or more chronic illnesses jumped from 7% to 13% in just 9 years; food allergies skyrocketed, and disorders such as autism, reproductive disorders, digestive problems, and others are on the rise. Talk to small farmers and you will hear tales of mafia-like tactics to force farmers to buy genetically modified seed. If a farm with genetically modified seed contaminates a farm growing its own seed, the farmer is likely to be sued for patent infringement. These companies have even bought up and shut down companies that sell non-genetically modified seed. These companies and their tactics are pure evil. The propaganda campaigns that genetically modified crops produce more food have not been born out and typically they are much more expensive to grow - requiring both seeds and pesticides. Pesticide resistant crops have pollinated with weeds that are closely related to them, creating super weeds. GM canola has been found growing wild in North Dakota and California, threatening to pass on its herbicide tolerant genes on to weeds. So how does Monsanto respond to weeds no longer being killed - they get ready to bring back Agent Orange and use it as an herbicide - which caused horrible suffering and birth defects in Vietname. Monsanto's dark past includes bringing over the Nazi scientist who developed Zyklon B, the gas used in gas-chambers, who then developed Agent Orange. Many of our most toxic pesticides were developed by Nazi scientists brought over to the U.S. after World War II. The genetic code in each of our cells contains DNA, the genes that are the building blocks of our body. In each cell RNA strips of the genes from DNA to create proteins and other molecules our body uses on a daily basis. It turns out that the food we eat actually may become part of our RNA. In 2012, Chinese researchers found small pieces of rice ribonucleic acid (RNA) in the blood and organs of humans who eat rice. This research team showed that this genetic material will bind to receptors in human liver cells and influence the uptake of cholesterol from the blood. The type of RNA that did this is called microRNA due to its small size and functions by turning silencing certain genes. It shows how genetically modified foods (GMOs) influence health in unanticipated ways. The problem with this is the GMO foods is that they use microRNA to "knock down" or silence genes. GMO modified cotton contains a knock down gene that enables bollworms to process a toxin gossypol, which naturally occurs in cotton- the worms then eat the genetically engineered cotton and die. Cottonseed oil is used widely in food. This mean that people who eat GMO oil from this plant would also lose the ability to block this toxin. Monsanto made corn plants the silence a gene for energy production in corn rootworms that causes the insects that injest this to die within 12 days. This conceivably silence genes for human energy production, leading to mitochondrial disfunction, which is fairly common within people within the autism community. The majority of these crops are now GMO: alfalfa (used to raise livestock), canola, corn, cotton, papaya, soy, sugar beets, zuccini, wheat. These crops are also at risk for GMO contamination: red beets, swiss chard, rutabaga, kale, bok choy, mizuna, Chinese cabbage, turnip, rapini, tatsoi, acorn squash, delicata squash, patty pan, flax, rice, wheat. Other GMO crops which have been approved include cherry tomatoes, potatoes, bent grass (for lawns), plums, cantelope, and radicchio. An article by a former Pro-GMO Research Scientist who says, "I refute the claims of biotechnology companies that their engineered crops yield more, that they have no impact on the environment, and that they are safe to eat."